"'Mom always made heart-shaped biscuits for Valentine's Day,' says Tina Christensen of Addison, Illinois. 'When I realized how easy they were, I continued the tradition! They're great anytime of year served warm with a honey or cinnamon spread.'" In a bowl, combine dry ingredients. Cut in butter until mixture resembles coarse crumbs. With a fork, stir in milk until the mixture forms a ball. Turn onto a lightly floured surface; knead five to six times. Roll to 1/2-in. thickness; cut with a 2-in. heart-shaped cookie or biscuit cutter. Place on an ungreased baking sheet. Bake at 450 degrees F for 10-12 minutes or until golden brown. For honey spread, combine butter and honey in a mixing bowl; beat until smooth. For cinnamon spread, combine butter, sugar and cinnamon in a mixing bowl; beat until smooth. Serve with the warm biscuits. These biscuits are only okay. This recipe is a keeper. Delicious. I haven't tried the spreads yet. 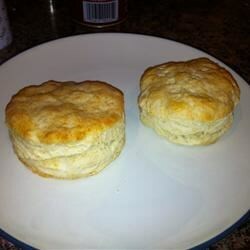 Great basic biscuit recipe! definitely a keeper! Thank you!